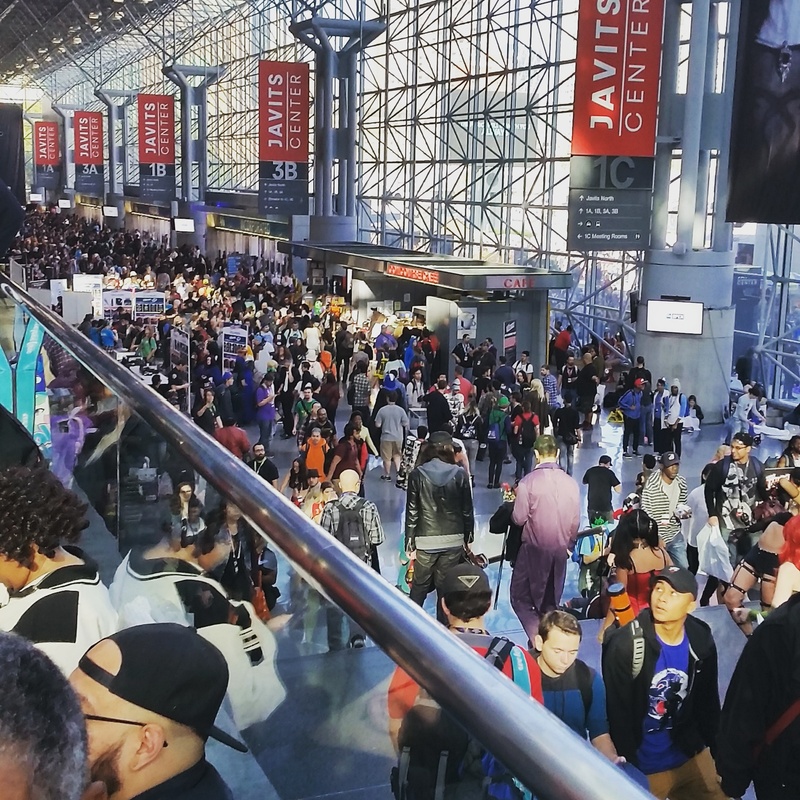 I finally have a chance, now, to sit down and happily reflect on my incredible experience at the 2016 New York Comic Con. What an amazing weekend! Because of life, I was only able to attend on Friday and Saturday, but my goodness, those two days were jam-packed with fantastic panels and shopping! No complaints here. 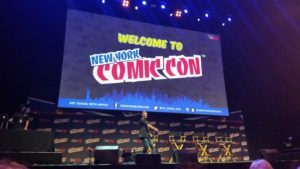 The Elementary panel was held at the Hammerstein Ballroom, which is a few blocks away from the Jacob Javits Center, where all of the vendors and artists are located. This is where the 2015 Elementary panel was held, and I think the venue really works for this sort of screening and panel discussion. Like last year, my good friend E helped me score seats in the second row, so we had a perfect vantage point to see everyone up close. Friends are the best! The view behind me (that’s me in the lower right corner, looking shifty). The ballroom seemed quite full to me, and based on the hooting and hollering, these folks in there were pretty passionate fans. The only downbeat of the event was the rather odd chap who was tasked with revving the crowd. Realistically, we were already hyped, but I was not interested in doing the Macarena, thanks very. The panel started with a screening of Episode 2, which was the ep that aired last Sunday. It’s always fun seeing Elementary on a gigantic screen, but I especially liked this episode, so it was even cooler. 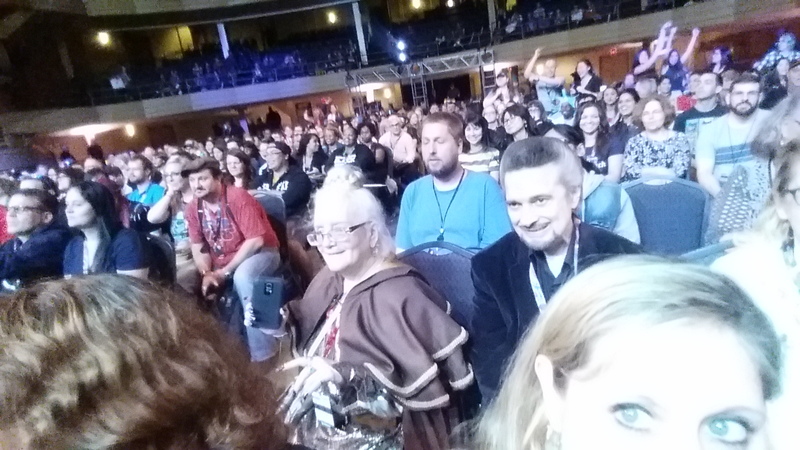 It’s also great to watch an ep in a room of hundreds of fans! Everyone gasps together, laughs together, AWWWWs over Clyde together…. Honestly, that was the hardest bit to keep secret. I wanted so badly to tweet out “OMG CLYDE OMG!” but I definitely didn’t want to ruin the fun for everyone. After the ep, and the cheering, the panel came out one by one: Rob Doherty, Lucy Liu, and Jonny Lee Miller. LL was wearing the most adorable dress – the stars, planets, and constellations were subtly nerdy, which is utterly perfect for NYCC! I love “subtle nerd” as a fashion ethos. JLM was wearing a cool Wu-Tang t-shirt, so he wasn’t sporting geek chic, but he looked relaxed and chill. One of the first things we learned was that the brilliant Nelsan Ellis was supposed to have been there, but he was very ill and couldn’t make it. I was very sad, both to have missed a chance to see him speak about playing Shinwell and because it sounded like he was not having a great day. LL spoke early on about people being “in repair,” and how that, along with recovery, is a theme of the show. She spoke about how she sees Watson’s motivation this season. JLM said that Holmes remains very suspicious of Shinwell, and that got a great reaction from the crowd. I guess we all agree with Holmes: Nobody better be hurting Watson! Side note: It will be interesting to see how Shinwell is developed. Will he fold into the Holmes-Watson adventures in a similar way to Canon? I hope so – we only get the briefest glimpse of the character in ILLU, but it’s pretty memorable. RD talked a little bit about the Season 3 finale, about how significant it was and about how addiction and recovery are portrayed on screen. He then teased us mercilessly, saying that “someone big” is hopefully coming back. The moderator (I believe) threw out possibilities, like Morland Holmes and, of course, Moriarty, but RD wasn’t budging. I appreciated his fortitude! We did learn that Virgina Madsen was coming back, and everyone was very cheerful about that fact. Then, LL suggested that there is going to be tension between Holmes and Watson. The crowd was not pleased. She mollified the masses by saying that she would be directing two eps this season. The people were happy once again. 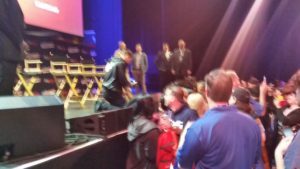 Fans from the crowd were invited to ask questions. Someone asked JLM and LL about their favorite moments in the show. JLM said his favorite aspect is the cast and crew, who he described as a family. LL echoed him. Another person asked for tips to make it as an actor, and JLM passionately advocated for community theater. One fan asked LL about diversity in representation in the media, and LL gave a great answer. I wish I would have been able to film it. A great moment happened when someone asked JLM and LL what their biggest pet peeves were about each other. The crowd gasped and then cracked up. JLM and LL looked amused and thoughtful. I think JLM really was trying to think of something funny to say, but he wound up just talking about how wonderful LL is, and that he didn’t have any pet peeves. LL talked about how wonderful JLM is to work with too – she turned the question back on herself, sort of, and delivered the funniest line of the panel. She said that the worst thing that happens on set is what they call “Two Line-Itus,” which is when one actor has pages and pages of lines to memorize for a scene, and is performing great in the take, and then the actor who only has two lines keeps messing up. LL had everyone cracking up – now I want to see out-takes where Two Line-Itus strikes! One person asked RD about what Canon stories he’d like to see made into episodes. RD thought it would be funny to say, “The one with the waterfall.” The crowd became nervous and twitchy. RD just smiled. The crowd behaved and did not riot. But it was really touch- and-go there for a minute! A fan then thanked RD for not having a romance form between Holmes and Watson. The crowd forgot about RD’s threat to waterfall Holmes and cheered loudly. Sadly, the Elementary panel had to come to a close. 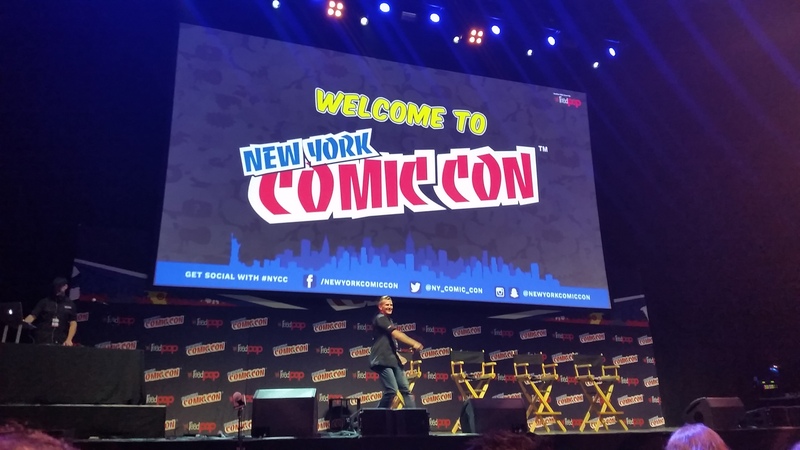 JLM and LL tried to keep answering questions, but NYCC runs on a pretty tight schedule. I thought it was really, really cool that both of them stayed, kneeling down at the edge of the stage to take pictures with the fans who rushed up to meet them. They were trying to shake everyone’s hand and take as many pictures as possible. That’s emblematic of my biggest takeaway from the Elementary panel: These people seem like such nice, kind, generous and grateful folk. They thanked the fans over and over again. They spoke about their characters with such open affection. They liked to laugh and kid, and they obviously really like working with each other. It’s so incredibly fun to be a fan because I always get the impression that JLM and LL love their jobs and love their fandom. Total joy, on both sides of the aisle!